Immediate payment of £33.75 is required. I like the quality of the print and ease of use and the ink use. The 'but's are a couple of things, it has an annoyingly short collection tray, so when a print is done it falls to the floor, fine if you have desk space in front, it also means longer documents can get mixed up, a minor annoyance but it looks a design fault. The other 'but' is that it can take quite a lot of delving through the software to bypass the automatic settings on the scanner, the quality of scans like the prints is very good and the copyi facility is excellent. 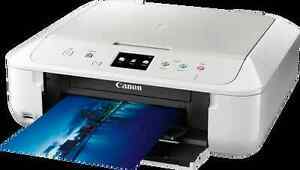 It's one of those printers which could have been so much better if Canon had just designed it a bit better. For the price I paid for a reconditioned model, £39.99 it was excellent value, I wouldn't have liked to pay the full original price. Print quality, not a patch on my previous Hewlet Packhard Photoprint printer. Dissapointing, nothing wrong with the operation of the printer but the print quality leaves a lot to be desired. Perhaps its the inks that were supplied with it ? we shall see. Bit tricky to hook up to my Imac, and required downloading some special drivers. But I got there in the end, and am pleased with the printer. It's fast, quiet and looks nice in white. Overall, it seems like a lot of kit for the money.